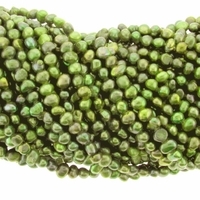 Olivine Green Baroque 5-6mm Pearl Bead Strand. These dyed pearls have a nice luster and color depth. Very pretty pearls -- love the color and shape.